Spoon 2 tablespoons of milk into a bowl and stir in the yogurt. In a saucepan, bring the remaining milk to a boil. Let stand off the heat without stirring, until it registers 100° on an instant-read thermometer, about 15 minutes; a skin will form on the surface. Using a table knife, make a small opening in the skin and carefully pour the yogurt mixture into the milk in the saucepan. Cover the pot with a kitchen towel and transfer to an oven. Turn the light on and close the oven door. Let stand for 16 hours. Using a skimmer or slotted spoon, lift off the skin and discard it. 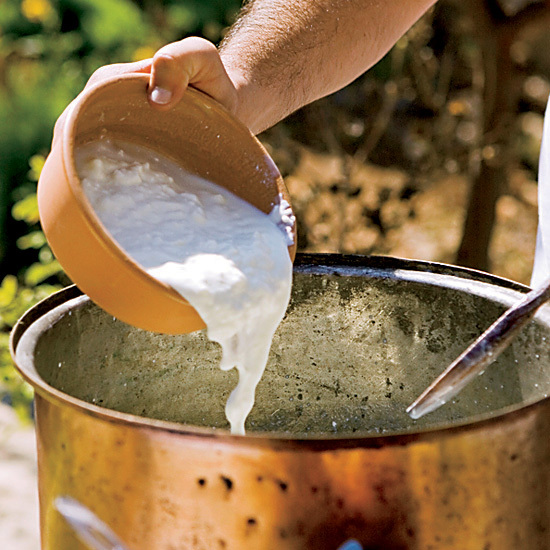 Carefully ladle the yogurt into a sieve lined with a double layer of cheesecloth and refrigerate until much of the whey is drained and the yogurt is thick, at least 4 hours. Transfer the yogurt to a bowl and serve.